California Minimalism 1960—1970 will present to the New York public a long-overdue survey of the particular kind of Minimalist work that was made in and around Los Angeles, work which differentiated itself in its emphasis on surface, synthetic materials, industrial processes, and perception. Often referred to under the umbrella term “Light and Space,” the artists and artwork included in this exhibition will present a more inclusive overview of the ground-breaking and diverse art practices that flourished in California in the 1960s. The exhibition includes rarely seen works by Peter Alexander, Larry Bell, Mary Corse, Laddie John Dill, Robert Irwin, Craig Kauffman, John McCracken, Helen Pashgian, James Turrell, DeWain Valentine, and Doug Wheeler. 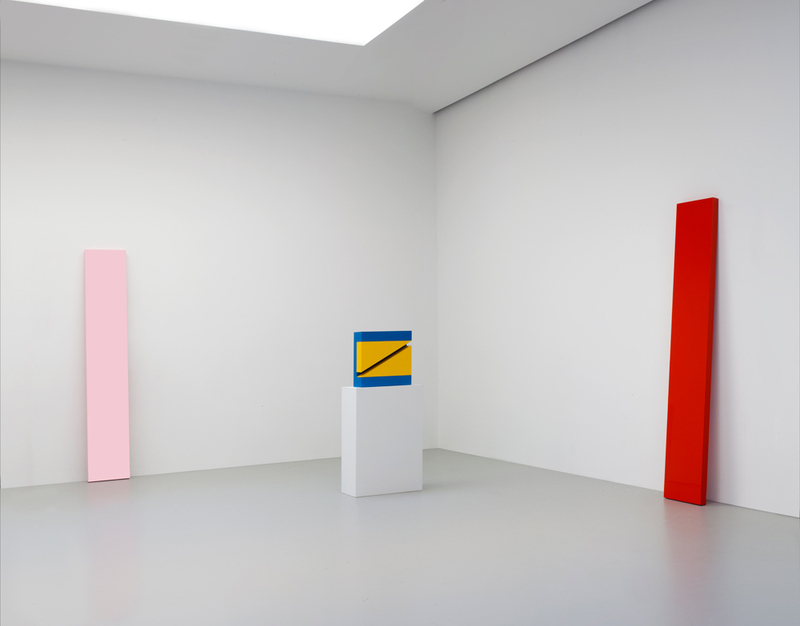 While the artworks included in the exhibition can be referred to as Minimalist in form, their seductive surfaces, often made out of nontraditional materials, and their luminescent use of color and light characterize them as uniquely Southern Californian. Distinguishing themselves from their East Coast counterparts, California Minimalists were reacting to local concerns with light and atmosphere, often evoking the qualities of the bright Los Angeles sunlight and the shiny, finished surfaces of the city’s ubiquitous signs and automobiles. Noted for translucent, reflective, or ethereal surfaces, the work made by these artists explored the often ephemeral boundaries between painting and sculpture and the broader experiential possibilities of art. Artists such as De Wain Valentine, Helen Pashgian, and Peter Alexander experimented with casting polyester resin in different formats, creating works which explore the material’s ability to both contain and reflect light. Alexander’s Pink-Green Cube, 1966, which consists of a pink colored transparent cube within a larger green transparent cube, explores the synthetic material’s qualities in relationship to color and luminosity where as Pashgian’s clear, geometric orbs (such as Untitled, 1968-69) deal with shifts in perspective and issues of translucency and perception. Valentine’s Triple Disk Red Meta Flake - Black Edge, 1966, uses fiberglass reinforced polyester to achieve beautiful tensions between exterior and interior spaces. conceived in 1971, the artist has subsequently installed distinct versions of this work in a site-specific manner: always using local materials, Dill configures the panes of glass according to the space in which it is installed. Kauffman implemented plastic as his primary medium, creating his best known work: a series of vacuum-formed, Plexiglas wall reliefs that investigate the material aspects of color. These glossy and symmetrical works utilized a vacuum-formed molding technique developed for commercial signage. His transparent, plastic “bubbles” were then painted from behind, achieving a luminous effect through the integration of color and ambient light, to create works which cannot be classified as either painting or sculpture. The highly-saturated, monochromatic surfaces of McCracken’s works are sanded and polished to produce such a high degree of reflectiveness that they simultaneously activate their surroundings and appear translucent. Thus, the objects gain a singular and almost otherworldly quality, appearing at once physical and immaterial through his application of color. His signature form, referred to as a “plank” (the exhibition includes Red Plank, 1967, and Think Pink, 1967), leans at an angle against the wall (the site of painting) while simultaneously entering into the three-dimensional realm and physical space of the viewer. McCracken’s work further challenged the notions of Minimal art through the artist’s interest in spiritual phenomena. Irwin began his practice by dismantling the act of painting in order to expose the perceivable qualities of color and space. The “dot painting” Untitled, 1963-65 (on loan from the Whitney Museum of American Art, New York), made up of small dots of color that interact with the viewer’s eyes, is an example of Irwin’s early interests in perception and its mechanisms. The exhibition will also include an example of Irwin’s freestanding, transparent acrylic columns (Untitled, 1970-71), in addition to an untitled work from 1969 (on loan from the Museum of Contemporary Art, San Diego) that is comprised of a white, convex disc mounted on the wall and lit from four points, casting numerous shadows to effectually dematerialize the object. Turrell’s work employs light as a medium. He creates what appear to be luminous three-dimensional forms which, upon closer inspection, resolve themselves into empty planes of light. Using colored light to cast geometric forms onto the corner of a room, these emanating projections explore the boundaries of the material and immaterial qualities of light to achieve perceivable visual forms that are distinct from the physical architectural space. The exhibition presents two such “corner projections” from the late 1960s. Wheeler’s Untitled, 1969 (illustrated on first page), belongs to a body of innovative light paintings known as his Light Encasement series (begun in 1965). These works consist of large squares of plastic, with neon lights embedded along their inside edges that blur the distinction between the work of art and its surrounding context. Generally hung on a wall in a pristine white room of precise proportions, these works create an immersive environment, absorbing the viewer in the subtle construction of pure space. Like Irwin and Turrell, Wheeler’s enveloping environments explore the materiality of light while also emphasizing the viewer’s physical experience of space. An illustrated catalogue with an essay by noted critic Dave Hickey will be published on the occasion of the exhibition in collaboration with Steidl, Germany.